It was meant to be 67, the best laid plans . 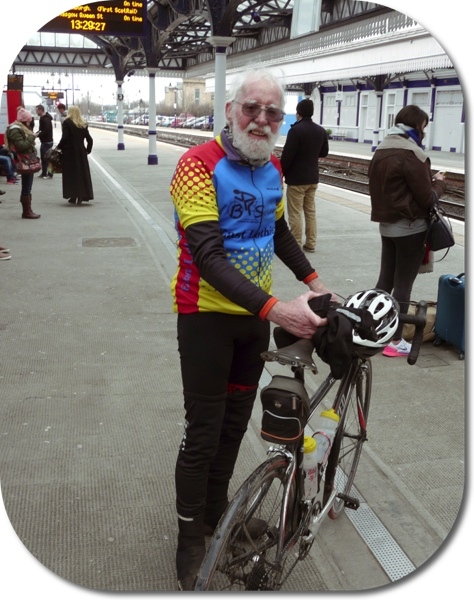 . . . .
Well, I had promised myself I would try to do 67 miles on the bike for my 67th birthday a couple of days ago. The forecast was unpleasant so I decided to go yesterday instead. 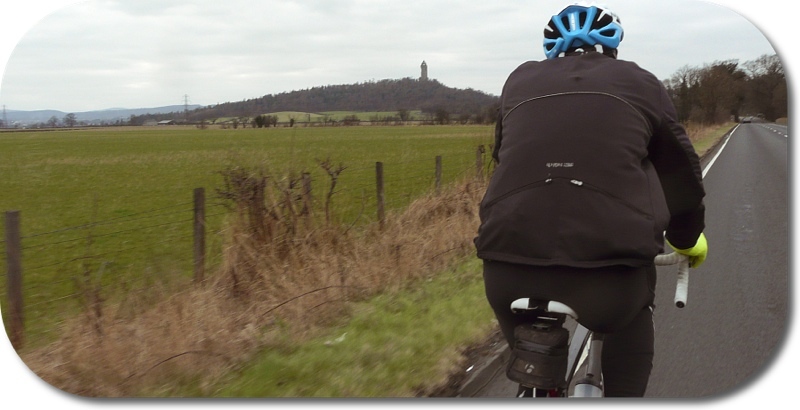 I had planned an interesting route to Stirling with a lot of cycle path mileage and a train journey back. Then Terry rang me up. He fancied chumming me so that was settled then. Back to the drawing board for a route amendment. So, early (for me!) start, and off at 7.30 am, temperature rising to the dizzy heights of 1ºC. But, the wind, though slight, was behind. So off up the road to meet Terry and then along the cycle track on the site of the old railway. A bit muddy and slidey in places, but hey life’s an adventure? Then back on to real roads and a sweep down to and along the Firth of Forth, past Musselburgh Race Course & over the Tyne. As you’ve probably realised it was a bit grey and murky, but sunshine was on offer later. 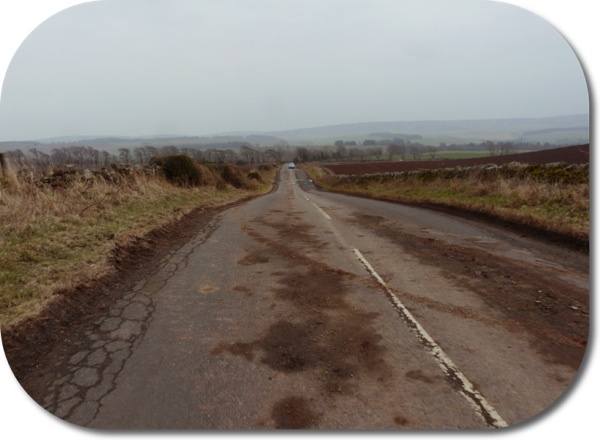 We then had a short section on the main road, till we got to Joppa and the start of ‘The Prom’. This is a lovely section except for dodging pedestrians, children, dogs, a boxing group doing an outdoor session and other cyclists. 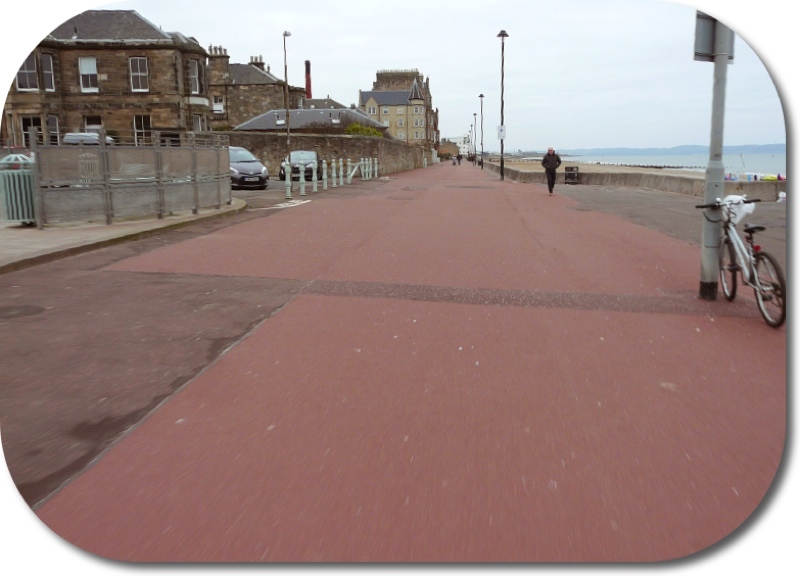 Then at the end of The Prom a bit more main road stuff till Leith Links, back on to cycle paths. I had loaded the route on to my Garmin and it urged me to go right. We obeyed and swept magnificently round in a triangle to land up where we started. This would not be the last time! So pedal on, the right way this time. 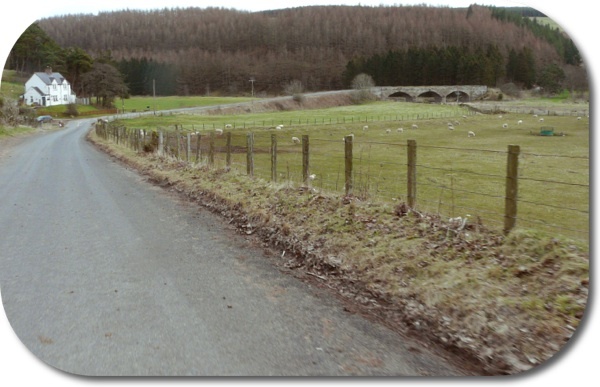 Down past Lamb’s House and then cobbles and more cobbles – felt like the Leith Roubaix! So ‘Sunshine on Leith’, except it wasn’t. 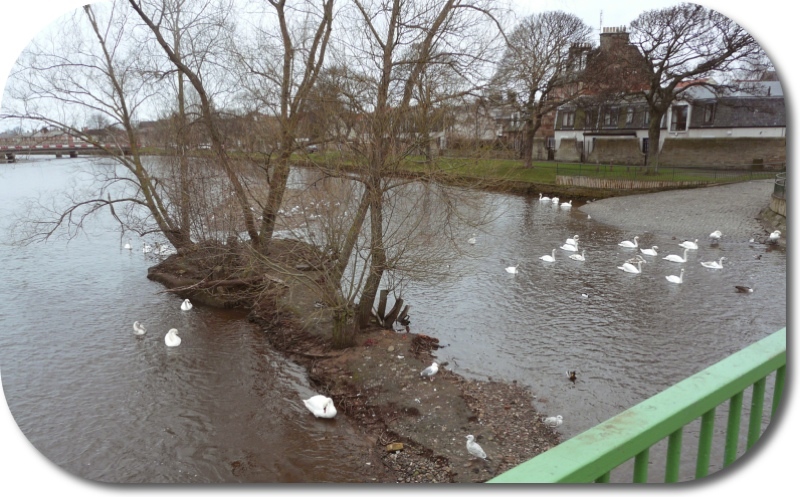 We passed over the Water of Leith, strangely enough where I had watched the filming a couple of years back. 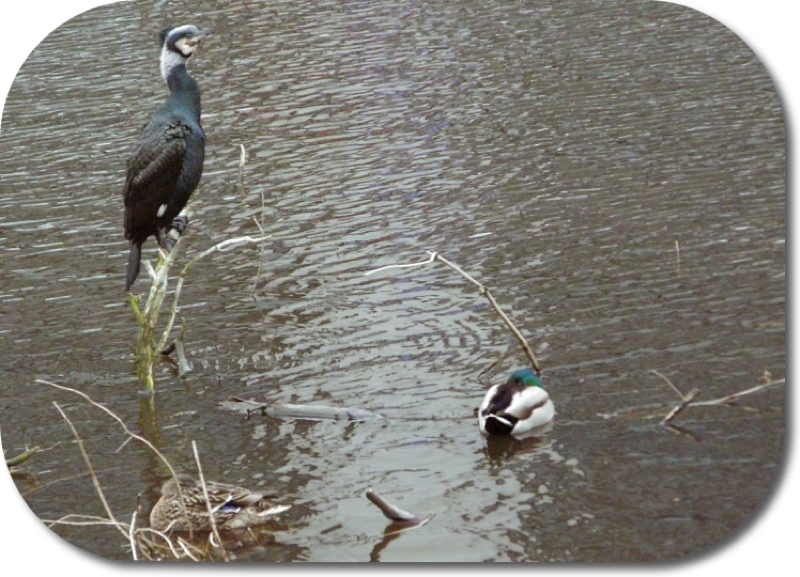 This time there was a rather odd cormorant of a type we’d not seen before. 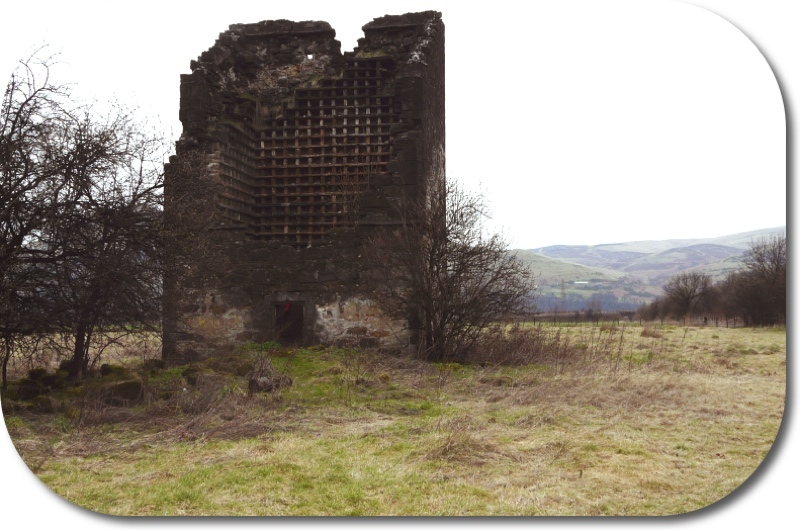 Once more we delved into the mysteries of the former railways of Lothian. I think because we were low down in the cuttings the GPS signal was somewhat erratic. Once again we shot off completely away from our intended route and landed up by the sea again. So it looked like another unintentional diversion – and once again not for the last time. 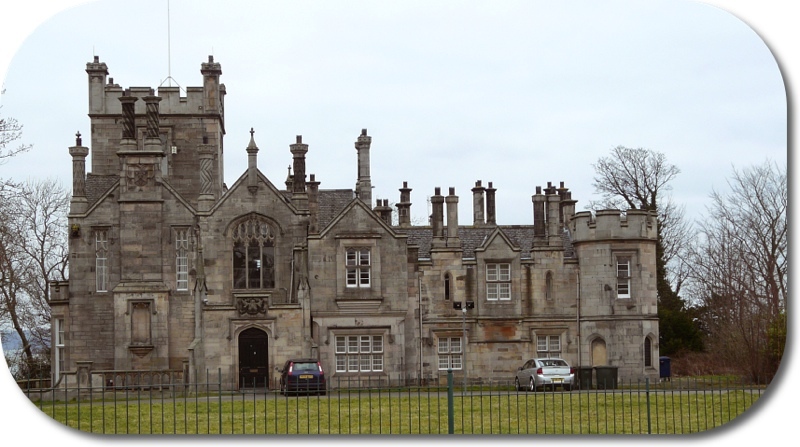 At least this time as we meandered round the coast and the deliciously named Silverknowes we passed by Muirhouse Mansion with its superb fancy chimneys. The area is now better known for its housing estates, but back in the day it must have been quite a place. We managed to get back on track more or less and passed by J K Rowling’s Edinburgh house. Time for a quick break. 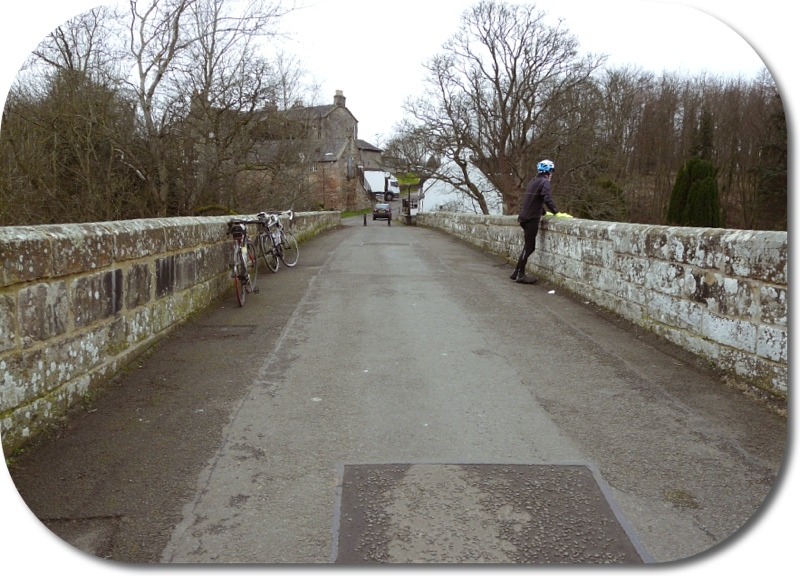 We stopped on Crammond Brig (Bridge) for a quick, a stretch and a non-fashion show. 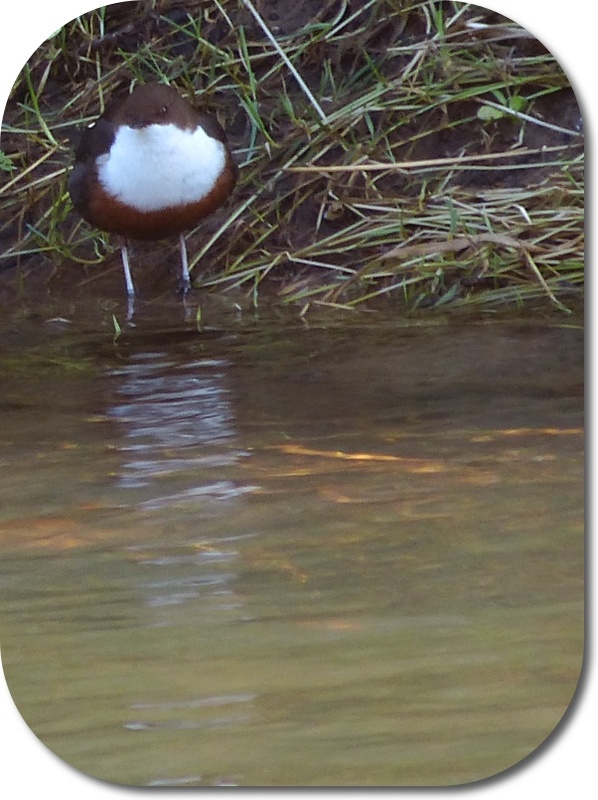 The river tumbled way down beneath us, brown with the recent rains. 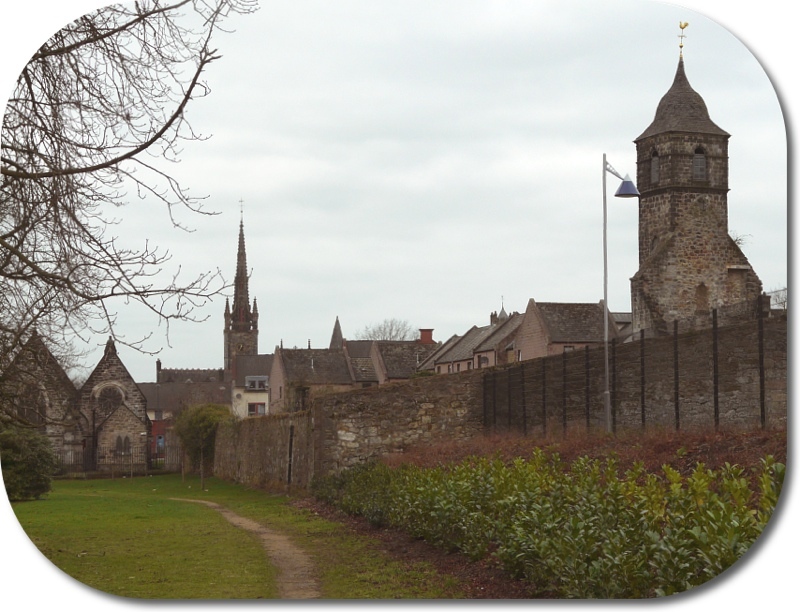 So refreshed, onwards and upwards – the tiny hill from the Brig beckoned. 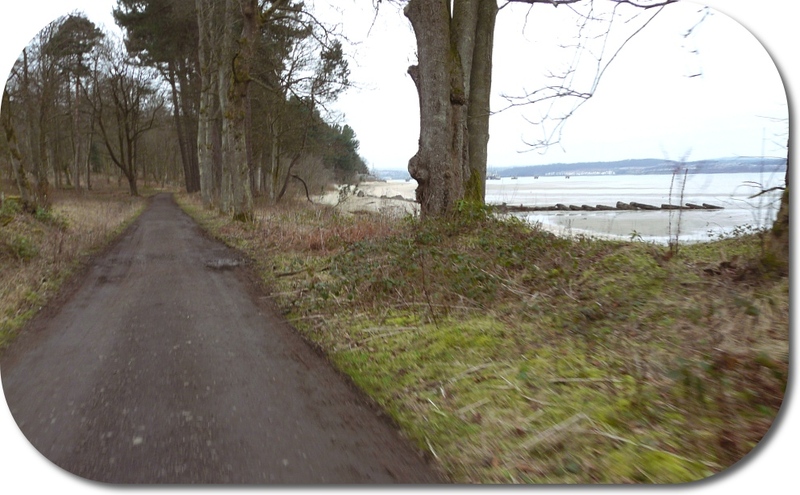 Great, a good stretch of cycle way, reasonably surfaced, lay ahead of us. We bowled along happy as anything after all the various twists and turns. Then, a big yellow sign lay ahead. DIVERSION it screamed in big, big letters. The cycle path was closed and the main road was definitely not an option. Off we went into the estate on a road that seemed as though the diversion would be a pleasant experience. We passed the local posh house, not sure if it is still occupied, but the horse outside was quite something. Then things became worse. The track deteriorated into bumpy, lumpy gravel, stones and mud. 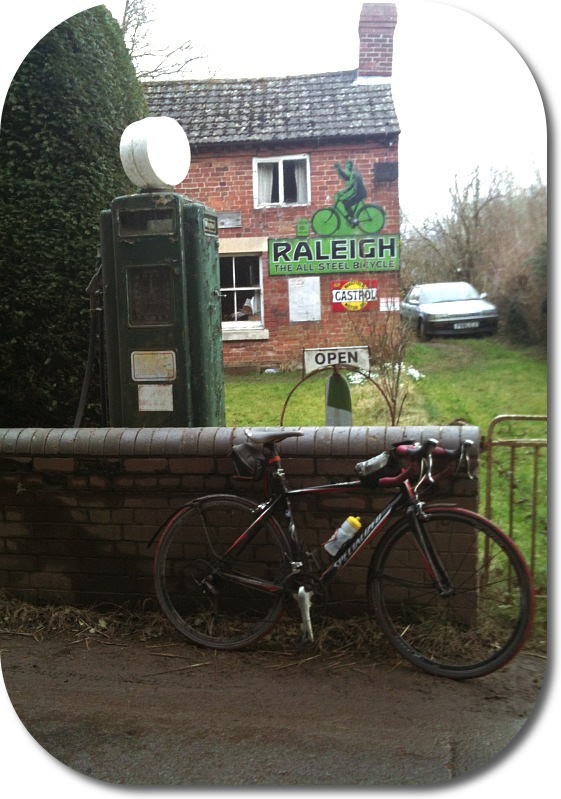 Arms, legs and backside were being hammered – it was the Dalmenny Roubaix this time, a special vibro masssage for free! Thank you Specialised for making a bike with zertz inserts and gel covered handlebars, and me for fitting 25mm tyres. Gradually though we came into sight of the Bridges. 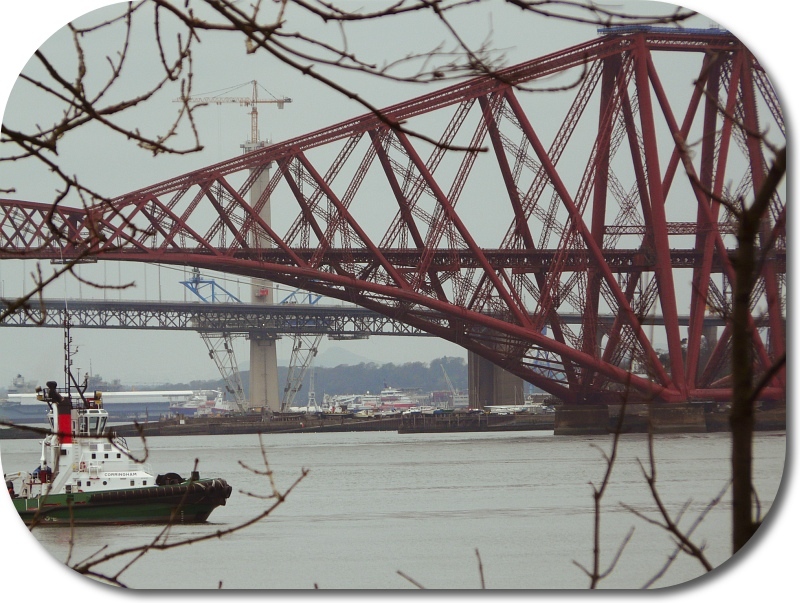 The iconic Forth Railway Bridge drifted into view vague behind the trees and gradually looming larger and larger in front of us. So the first part of our journey was nearly over, all we had to do was find a way up onto the road bridge. Off we went through the town. Oh No!! More cobbles and this time the worst of the lot. 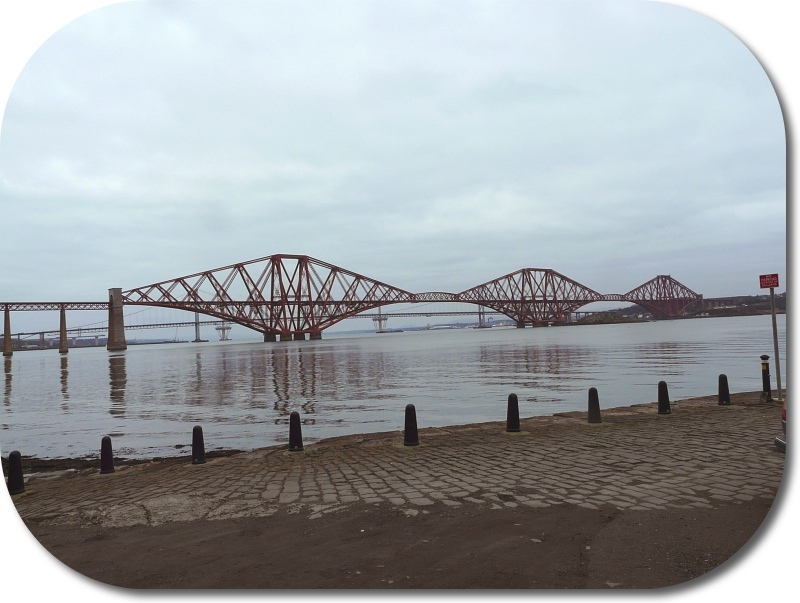 It was the South Queensferry Roubaix. With chattering teeth from the vibrations we popped out at the far end and lo and behold a wee ramp leading up to bridge appeared before us. My Garmin informed us that we were on the right route again. 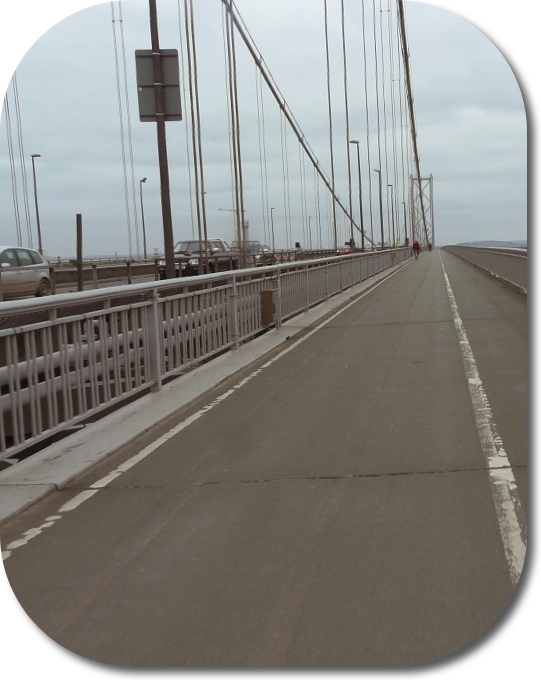 And we had a lovely cycle track across the road bridge and the Forth, even though the cars and lorries were thundering past beside us. Hurrah, we had at least reached Fife. We trundled through Inverkeithing, up past a fine old fashioned bike shop, but no time to browse. North, go north we did and eventually picked up a cycle track leading off to the east along a former railway with the wind pushing us gently along. Oh joy. Unfortunately we had to skirt through Dunfermline and guess what? Yes we got mislaid yet again, not sure why but at least it was just for a little. Eventually we started tramping along passing dogs, runners, walkers, cyclists, prams but this time horses as well. 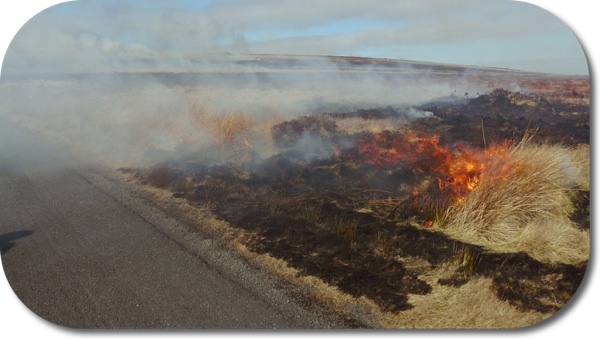 The Ochill hills also began to get closer. Only downside was stopping to stretch and eat some Jelly Babies, which we promptly spilled onto the ground covered with effects of all the various human and animal traffic and certainly not too edible after the baby spill. Now guess again what happened after this? Yup – maybe going too fast, maybe day dreaming, maybe taking in the scenery too much. 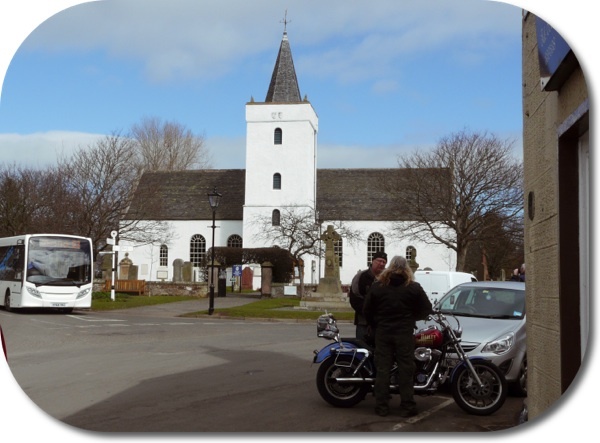 We missed another turning and landed up too far north at Menstrie. This time it was a busy main road with loads of unpleasant traffic after the quiet of the cycle tracks and a cold headwind to add insult and still no sun. Drafting time after having been companionable most of the way. 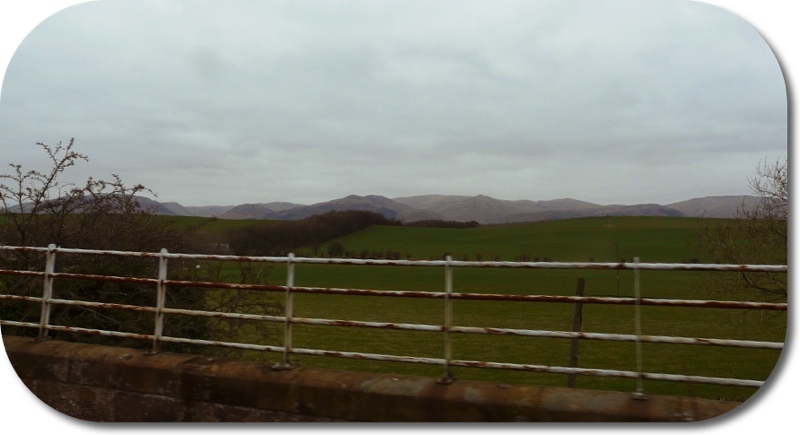 But the Wallace Monument (aye, him of Braveheart fame) grew closer and our destination was not far down the road. 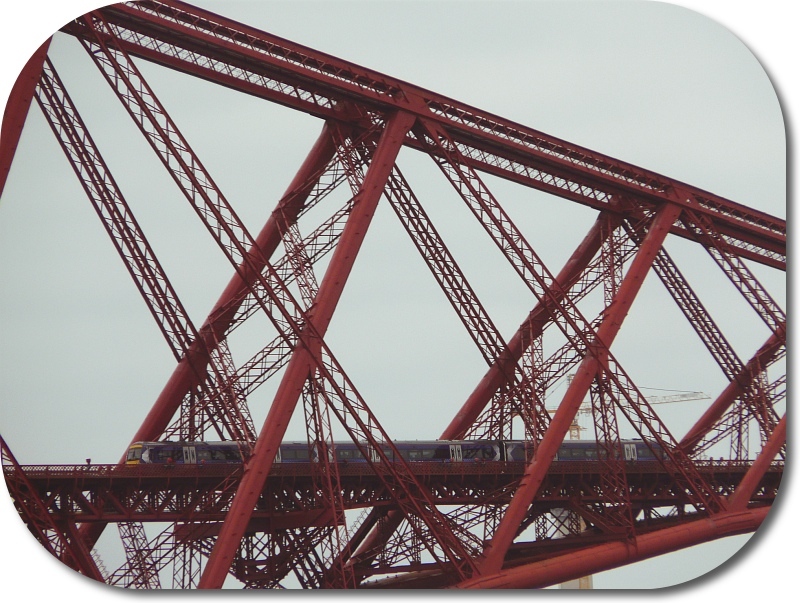 Past the monument (must go one day), wheech down the side roads, over the Forth, a lot smaller here, over the bridge and into the station. Hurrah we’ve made it, coffee, rolls maybe cake as well. But no chance, the next train was leaving in 7 minutes, so tickets hurriedly bought, bikes hauled up and down station stairs and onto the platform for a short wait before the train announce itself. Onto the carriage and a nice young lady removed her bike from the rack to make way for us as she was getting off at the next station. 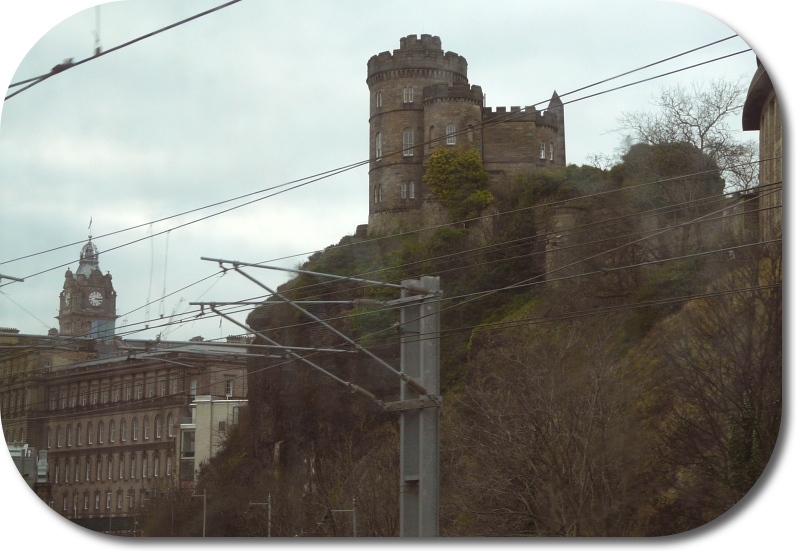 Back to Edinburgh, there was a connecting train in a few minutes but we couldn’t face it. Off to get a giant coffee and a massive baguette, much needed by now. Then over to the platform for the next train, this time using the lifts. In this busy station we couldn’t face lifting our bikes up and down the crowded stairs. 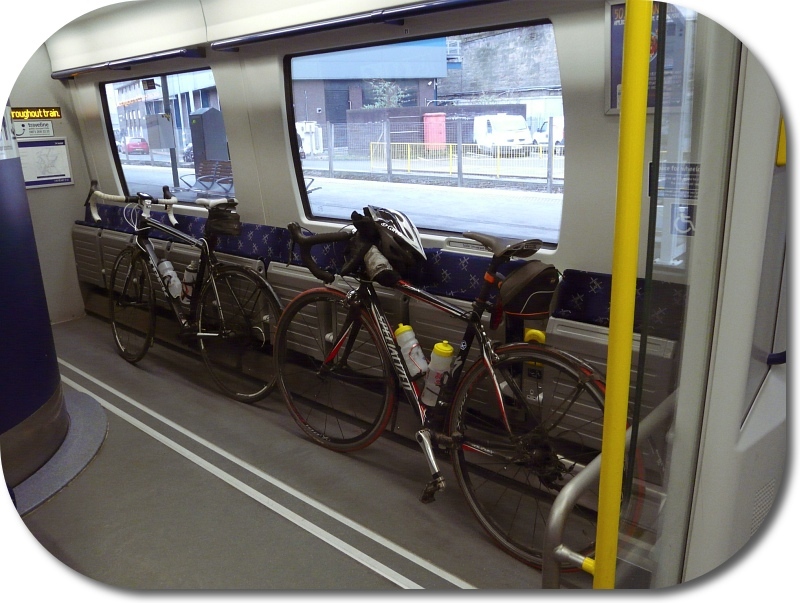 Then onto the train, a bit of luxury for the bikes and views of Edinburgh’s old jail as we sped towards our final section of the journey. 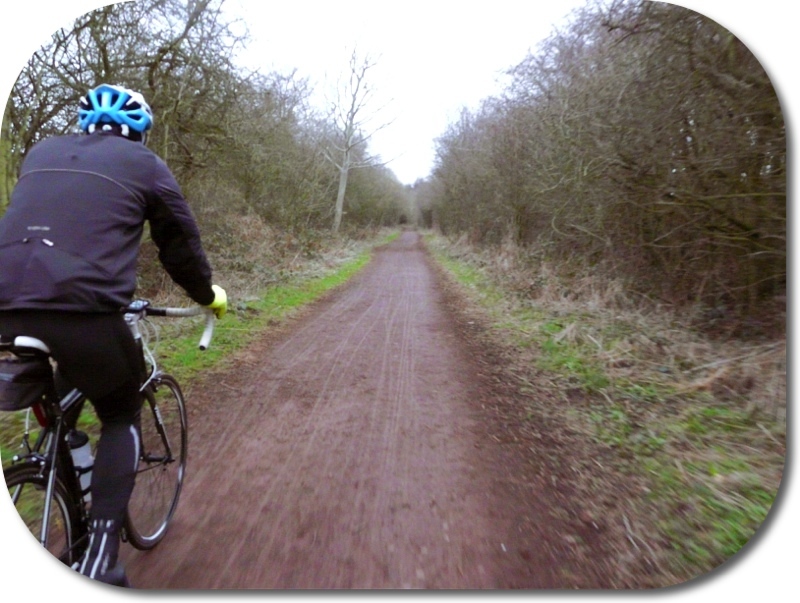 Back along the chilly, muddy cycle path when suddenly Terry was going really slowly. I thought the distance had got to him a bit. 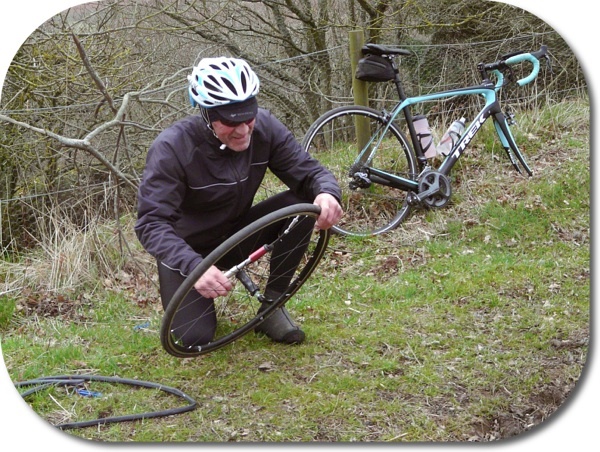 He complained that the bike sounded as though the rear wheel bearing was going. When I looked the rear tyre was flat. We pumped it up and with just 1 km to home Terry was totally determined just to get back. 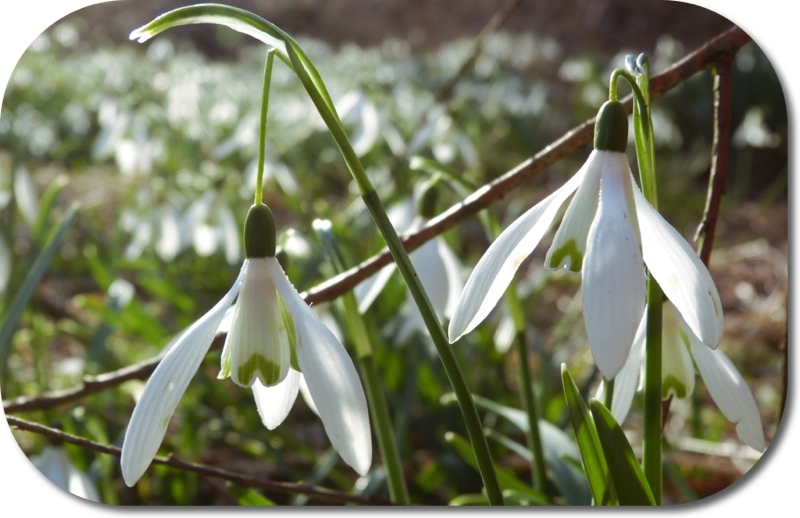 After a cheery farewell I was on my own again, into the wind and the temperature down to 3ºC. I got to the hill above the village and looked at the mileage. It was 137km. 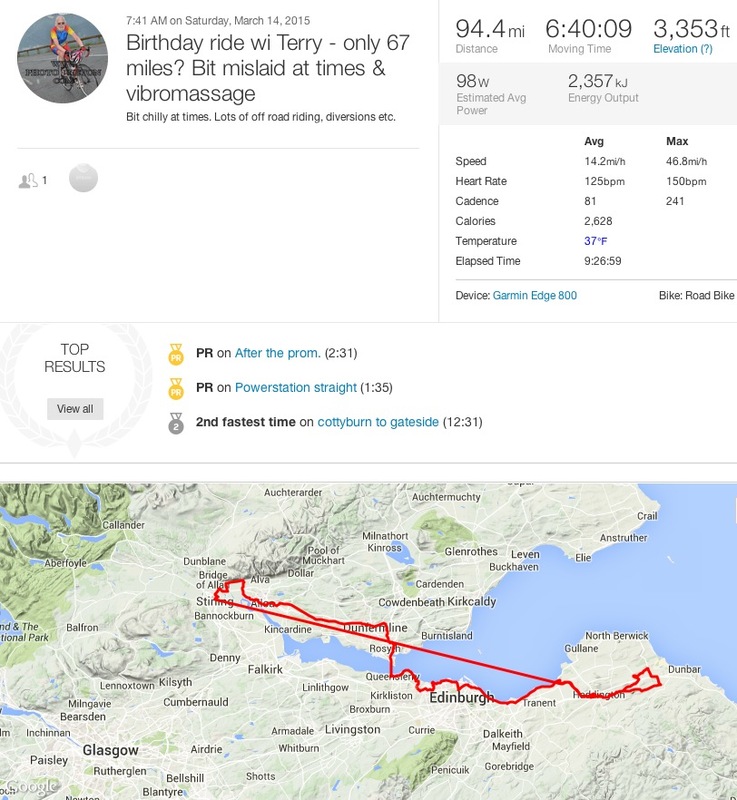 The latest Strava Grand Fondo Challenge was 150 km – how could I resist. So off on an extra circuit with a wee bit extra thrown in and then home. Yeh, done it!!!!!!! 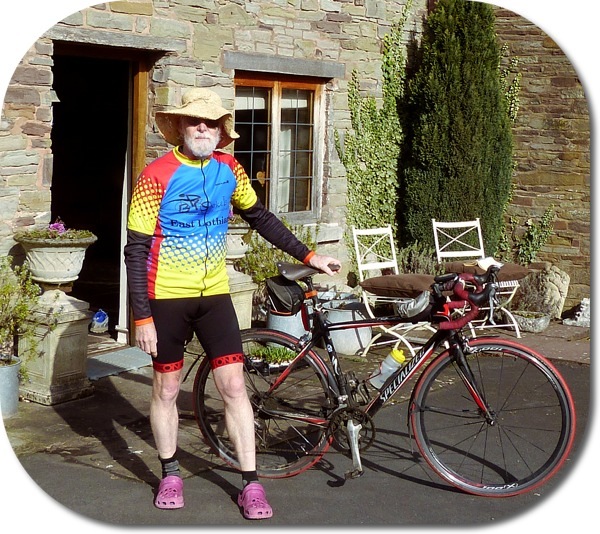 With all the extras thrown in my 67 mile trip had become 94.4 miles (151km) and I felt great. And today as a mini celebration I went sea & surf canoeing with a pal. Note: Normally I take a route map along as I find the Garmin map hard to read. Because of the last minute changes I didn’t manage to print one off – the very time I could have done with it. Also apologies for the photo quality, lots of them taken on the move from a camera over my shoulder on automatic, ah well. 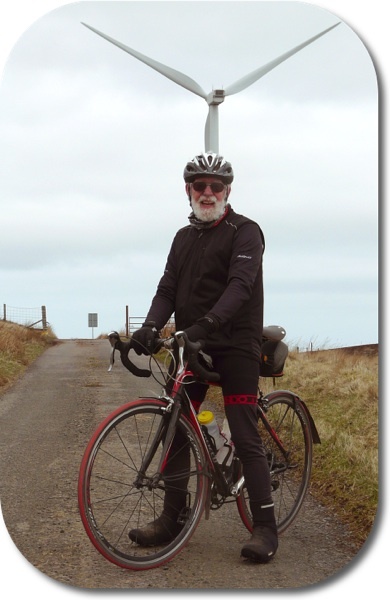 This entry was posted in bicycle, bike, birthday, Fossil cyclist, long ride and tagged bike, birthday, cycle paths, cycling, effort, fossil cyclist, long distance, Long ride, Scotland on March 15, 2015 by fossilcyclist. It started with my nephew’s bike. It’s a touring bike with a good selection of gears, straight bars, slightly heavy and upright and also a bit too big. We were all staying at his aunt’s in the wilds of Herefordshire. 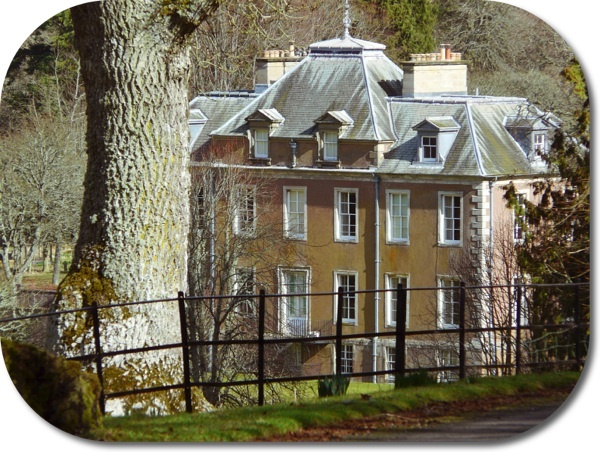 The house is up on a ridge in a countryside full of narrow back lanes, muddy, damp and pot holed. But, a bike is a bike and I was grateful for the loan of it. I discovered that starting near the top of a hill is a drawback as there’s always that climb up at the end of the day. 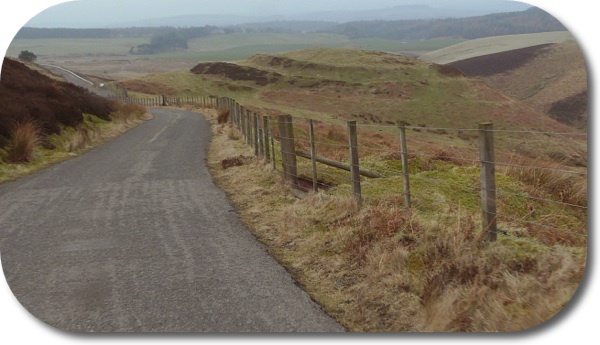 Also, the area is fully of steep hills, often ramping up to well over 15%, often with a wee section of 20%+. So it is all quite challenging. 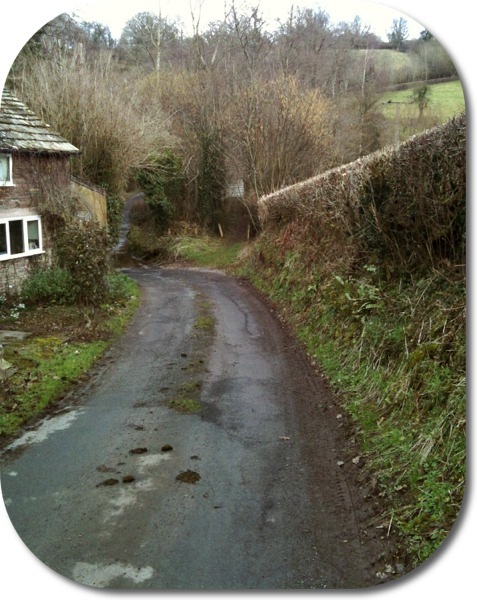 On one of my rides I discovered Mill Lane. Aghghghghghghgh – and I’ll tell you why later. 2/3rds of the way up I was struggling and staggered off and started walking, slowly, very slowly. But the challenge had been set. Next day, a short ride and I was back. This time, heart pounding, lungs gasping, legs aching I was up without a dismount. Yippee. 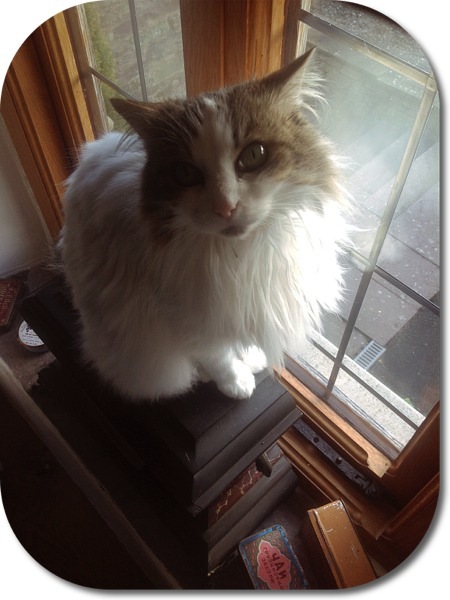 When I got home and uploaded my stats I discovered, much to my amazement, I had become King of that particular mountain. So, 8 months later, I was back, relegated to a lowly 2nd place on my nemesis. 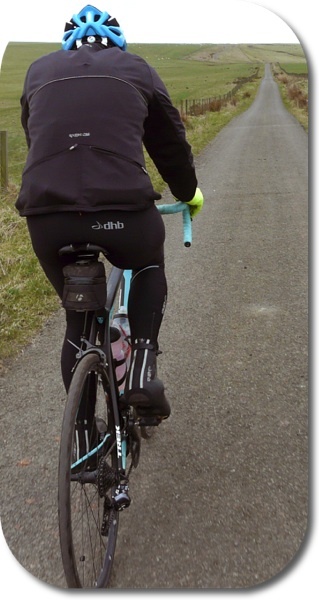 What every cyclist should wear? 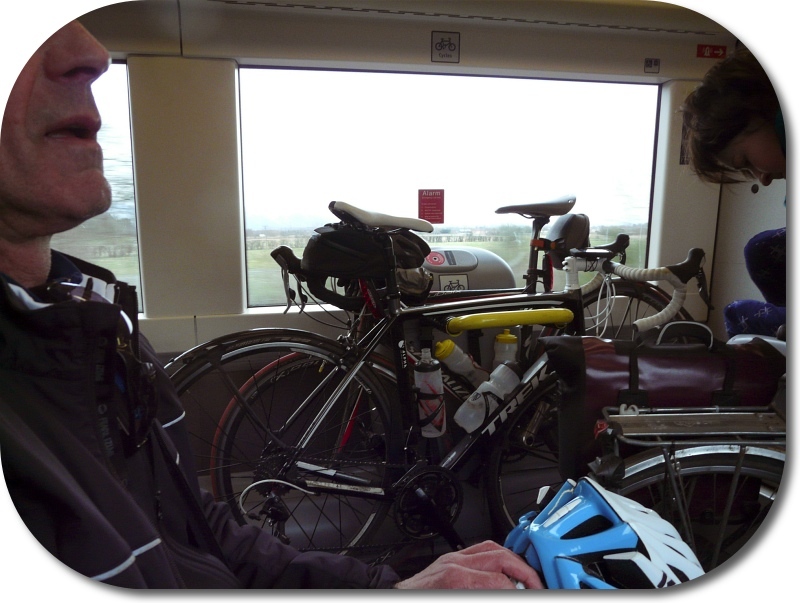 This time I was with my trusty steed ready for “That Hill” This time we were cat and house sitting. By this time you might be thinking, “What is it with this guy and this hill?” or maybe not. Well now, the hill starts right after you’ve passed what looks like an old mill house, then cycled down the stream to emerge at the slope ahead. You then know you’ve only got half a mile to the top. First you cycle down the stream!! The hill rises up to the top right. Straight away it ramps up to over 20%, take it easy, take it slow, take it easy take it slow, then a wee rest at 15%. Oh no off again, another 22%+ ramp, then another ‘flat’ bit at only 10%. Onward and upward, wheel spin on the gravel as the next 20% section is underneath the bike, then a turn round the bend at a mere 17% before the final kick up at over 22% till it eases off with an almost downhill feeling 3% (OK well not quite, but it certainly feels easier). So, take it slow at first, up out the saddle by the third ramp and gasping and spluttering as I reach the top of the fourth steepest ramp. Then ahead of me a car looking abandoned across the road with its passenger door wide open, almost blocking the path ahead. I manage to crawl past the driver’s door, gasping something to the woman putting up a notice beside me. I recover enough to get to the top. Done it!!! Later, when I look at the result I see I’ve just exactly equaled the time on my last attempt. See that car!! So next day I know that !@£$%^&?|>!! hill has still got my name on it. So, three days later, after being penned in by the weather, rested and recuperated, I’m ready. A quick 5 mile warm up and I’m at the bottom again, cycling down the stream. Scooting up the first bit – easy, then it bites back. I’ve gone too fast. By the fourth steep section I’m puggled. I’m sure I can taste blood in my mouth, I’ve just overdone it my breathing and heart rate seem to have gone ballistic, should I do this to myself? It’s the walk of shame again. I push the bike up that last steep section, hop on and try to cycle quickly up the last section. Ah well, not to worry, won’t be down this way for a while so maybe next time and it’s off for another 20 miles of ups and downs. 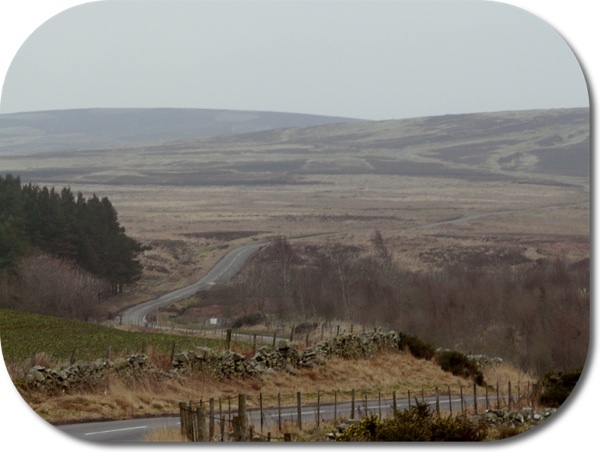 The ride is excellent, though clarty, passing buzzards, ducks, cows, tractors, the amazing house shown above and the army base where the SAS are rumoured to train. We watched a dismantled Boeing 747 swathed in white plastic on three huge trailers negotiating the narrow lanes on its way to the base the day before. Presumably to be used for training. Got home and loaded up the stats much later. Wow! Even with walking it was my fastest time up that hill, well I never! 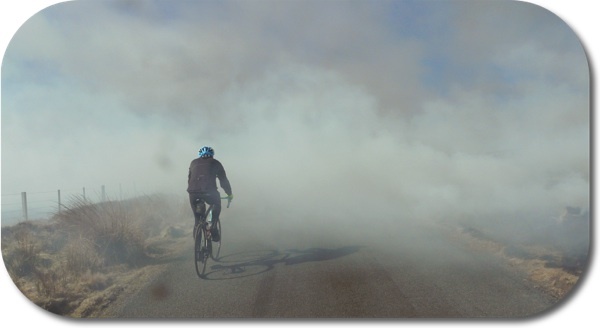 And who was the person with the KOM? It turned out to be a pro rider from Texas on a 100 mile jaunt, so a different league altogether. But if I’m back later in the year . . . . . . . 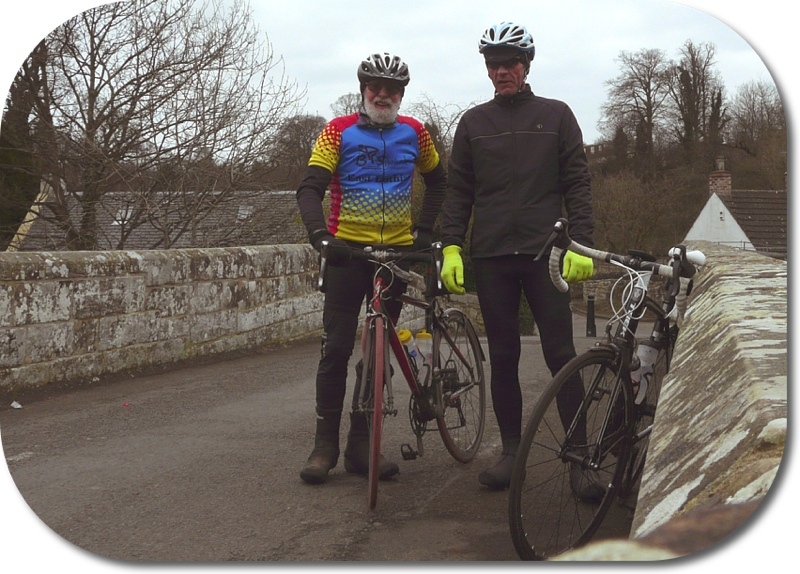 This entry was posted in bicycle, bike, birds, climb, countryside, cyclist, ford, fossil, hard, SAS, steep and tagged 20%, bicycle, bike, cat, climb, cycling, fossil, hard, herefordshire, SAS, segment, steep on March 2, 2015 by fossilcyclist.